Emile Vernet-Lecomte, or… Pierre Tetar van Elven? Closer examination of the Tinco Lycklama portrait, currently on display at the Musée de la Castre in Cannes, reveals that the painting is signed by not just one but TWO hands. The search is on to understand this ‘mystery’. The portrait of Tinco in oriental garb is generally attributed to Emile Vernet-Lecomte (1821-1900), a French orientalist painter. His name is clearly visible on the left bottom of the painting. It is dated 1869. 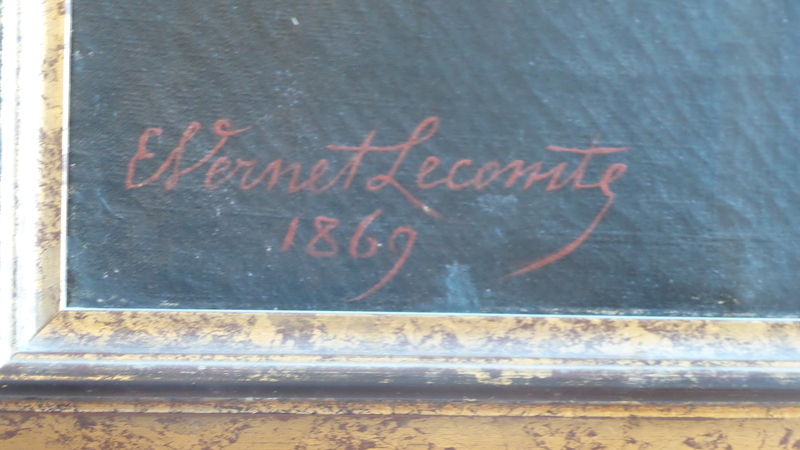 Understanding the relationship between Tinco Lycklama and Vernet-Lecomte certainly makes part of our research. But, Tinco himself attributes the painting to Vernet-Lecomte. In the act of donation of his collections to the city of Cannes, he specifies that the painting by Emile Vernet-Lecomte (“of Paris”) should have a prominent place in the museum at the Town Hall”. 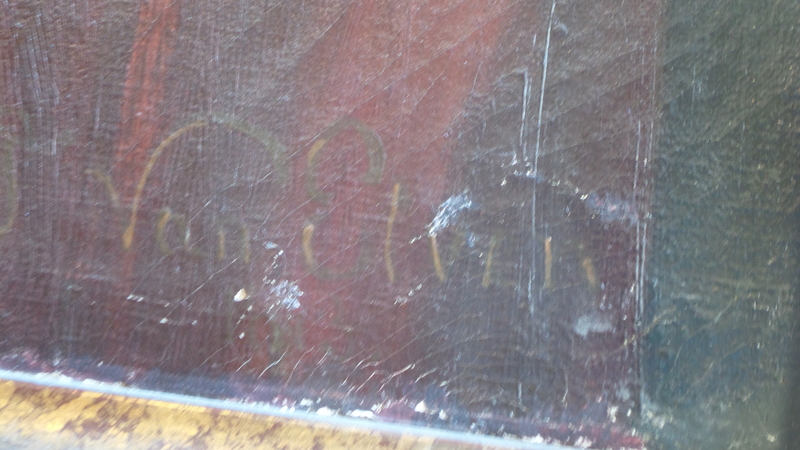 However, as the illustrations show, a close-up of the right bottom of the painting reveals another name – “Van Elven”. Pierre Tetar van Elven (1828-1908 – see his file on RKD…) was an acquaintance of Tinco Lycklama and nephew of the better known artist Paul Tetar van Elven (1823-1896 – see more about this family of artists on the Tetar van Elven museum website…). Pierre was the artist who painted the “Bal Masqué” that took place on February 1874, at Tinco’s Villa Escarras in Cannes. Pierre also purportedly travelled with Tinco to the Middle East (research is pending). There is a good chance that more drawings or paintings from these travels (or, more directly, about Tinco) may exist. The portrait of Tinco is attributed to Emile Vernet-Lecomte himself. But, why the specific mention of “van Elven”? The signature at the bottom right doesn’t look like Pierre’s usual signature. To make this question even more pertinent, we discovered an 1869 black/white photography in the collections of the Fries Museum, showing a highly similar portrait of Tinco. The source suggests that the photographer is “Bingham”. This makes us think of the pioneer English photographer Robert Jefferson Bingham (1825-1870), who spent a lot of time in France. Here we see Tinco in an Albanian costume, but the face, posture and settings are virtually identical to the portrait at the Musée de la Castre. Is this painting on the black/white photography by Emile Vernet-Lecomte, or by Pierre Tetar van Elven? Which was the original painting, and who copied who? And… where is that portrait of Tinco in Albanian costume? These questions may seem details. But, after all, this is about one of the finest portrayals we know of Tinco. And, by finding the answers, we may also discover more about the relationship of Tinco to these artists, and about his travels.